Sun City Palm Desert (SCPD) is one the largest and most well received gated 55 plus developments in South California. 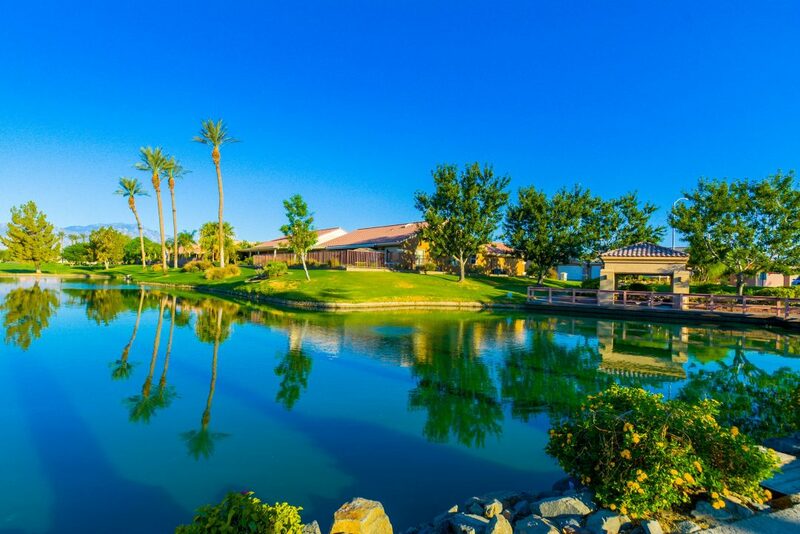 Sun City Palm Desert stands comfortably on over 1,600 acres with incredible mountain views. Residents and occupants in this area will have access to active lifestyle beyond expectations. The amenities, lifestyle and social aspect of this community make SCPD a superior choice for an adult community in the Coachella Valley. Included the Homeowners Association (HOA) fee and the ownership of a Sun City PD home, residents gain access to state of the art amenities for golf, tennis, paddle tennis, bocce, softball, catch-release fishing, fitness centers, several pools, and the dog parks. These amenities are available to residents and renters as a part of the HOA fee (with the exception of the green fees for golfers). 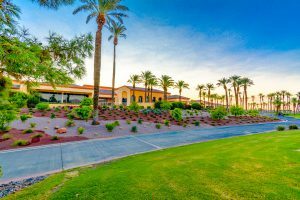 Residents will also have the ability to meet new people, with of a plethora of entertainment venues and sociable hot spots in Sun City Palm Desert. The prime location found in this community gives occupants access to a wide array of retail shops and food establishments, which are located on the outskirts of the community. The community, which was formerly under the name of Sun City Palm Springs, changed its name to Sun City Palm Desert in the year 1992. If you’re a potential home buyer looking to get a home in the Greater Palm Springs Area, you can rest assured that you’ll be more than satisfied with this community. SCPD offers many different price ranges, each dependent on the size of the home. Looking to buy a home in the area? 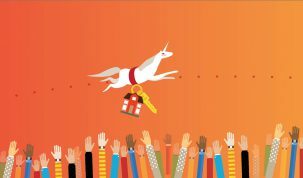 Fill out this buyer form to get a quick call back from a real estate professional – Click here. 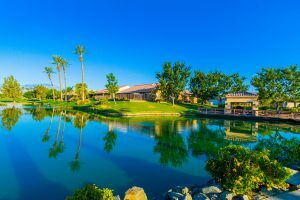 When conceiving and designing the clubhouses, amenities and home floor plans the original builder (Del Webb) paid very close attention to the details – and it shows. Carefully constructed gems like the catch-and-release fishing pond were designed with thoughtful inclusions such as bathrooms and soda machines. It is the attention paid to details like these that continue to be a huge draw to the community. Once you enter the gates at Sun City PD it is apparent that it functions as its own small stand-alone city. There are social clubs, gatherings, restaurants, elections, entertainment, and sports tournaments all created within SCPD. With all that is available in this development you can rest assured that you’ll never run out of fun and interesting activities to indulge in. The cycling club, travel club, hiking club art club, photography club, book club and wine club are just a little taste of the well over fifty social clubs that are open to residents. You will also be able to enjoy games such as Scrabble, Poker, Chess, Billiards and really any other game that you might be into. With periodic tournaments, you’ll be able to test your abilities against other people living in and visiting Sun City Palm Desert as well, and most importantly have fun whatever your enjoy! 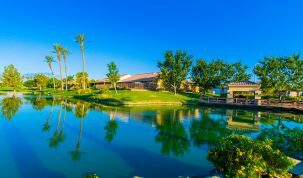 The freedom of choice, lifestyle and resort living that is enjoyed by residents of SCPD can also be experienced in its namesake city of Palm Desert. Palm Desert is the quintessential resort city, with an array of events, shopping experiences, and dining options. With spectacular mountain views from almost anywhere in the city, the date palm laden streets and the natural scenic beauty Palm Desert is a breathtaking escape. Palm Desert hosts the desert’s premiere venue for live entertainment – the McCallum Theater. Here, you will be able to experience live Broadway drama, comedy acts, amazing acrobatic displays and live music. The surrounding mountains are an ideal location for those who would love to go for a hike, camping spree or a little horseback riding adventure. Also the Palm Desert / Coachella Valley is one of the best golfing destinations on the planet, with the 120+ golf courses in the area. Living in a Palm Desert means having easy access to some of the finest event locations in the word and this is something that residents of Sun City PD are sure to enjoy! The city also has a great reputation for having some of the best shopping locations you can find. When visiting Palm Desert, feel free to pay a visit to El Paseo. On El Paseo, can find some great works of art with a selection of over 17 different fine art galleries, as well as fresh food and award-winning dishes from both local and international food vendors. Dubbed by many as the “Rodeo Drive of the Coachella Valley”, this ultimate outdoor shopping bonanza is packed full of unique retail vendors, beautiful dining options and high-end fashion shops.